Before this month ends, MyPhone gives us a chance to experience their latest and first Quad core android phone as it is available on one day sale at SM North EDSA. 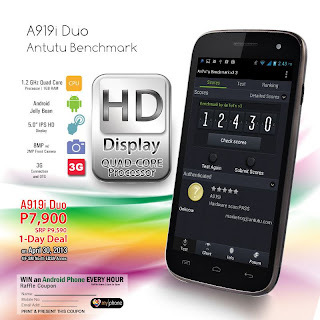 Offer in a huge price drop from its suggested retail price (SRP) of 9,590 pesos down to P7900. This is what all MyPhone fans are waiting for since their A919 smartphone release. 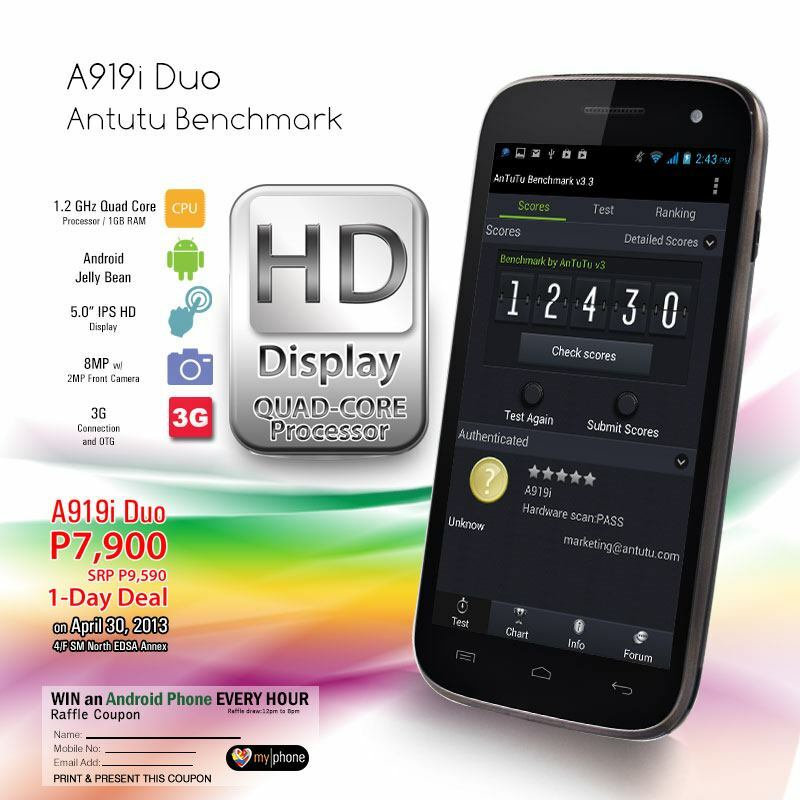 The new A919i Duo is loaded with the latest Android OS Jelly bean, in HD 5 inches display, 8-megapixel camera, 1GB RAM and 3G capable. Go grab this phone on April 30 as it will return to its SRP after the 1-day sale. To get to know more about this phone, a commenter on MyPhone FB page posted a link pointing to Micromax A116 Canvas HD that seems to have identical specifications with MyPhone A919i Duo. You can read more reviews, comments and feedbacks about Micromax A116 Canvas HD here, but still no confirmation if this the exact model rebranded by MyPhone. If you are asking on Antutu Benchmark result of A919i Duo, they posted it on the image above for reference. Guys, f you want to get this phone via installment basis at zero percent interest you can get at MX MemoXpress or read their offers here. Although A919i DUO do not use the full potential of MT6589 SoC, MyPhone can still improved and released another Quad-Core Android phone in FULL HD Display with Dragon Trail Glass technology, sports a 12MP/2MP BSI dual camera and 2500 mAh battery at affordable price (lets call it A919g DUO, just a suggestion). baba ng camera mabuti pa cherry mobile at starmobile and gaganda pa ng bagong labas 12mp pa at quad core.. sana ginawang 12mp. to pra di na mapagiwanan ng cherry at star.. pero ok din namn ang price.. kung gus2 nyo branded with good price lenovo phones ang recommend ko sa n.u. Wala naman sa megapixel count ang ganda ng camera. Nasa quality pa rin ng lens, software na gamit at laki ng sensor yan. not totally agree, megapixel plays an important role also in terms of photography, or else why these manufacturer keep on upgrading the mp counts of their cameras if mpixels isnt not much of importance. even if you have the most advanced lens in the world but your mp is only 3 di rin masyadong maganda ang quality nun lalo na kung large format ang target output mo. kung film pa ang gamit ng mga camera ngayon at camera phones pwede mong sabihin na di importante ang pixel nos sa resolution ng shots. kaya nga pixel kasi picture elements which is determined by dots in a "DIGITAL" image. pwede ba makapagrecord ng hd ang camera kung vga lang gamit mo or 1.2mp lang camera ? di ko naman ata matake na bumili ng cameraphone na advance lahat ang features at maganda ang lens tapos 3mp lang ang resolution? kayo, gusto nyo yung ganun? hehehe.